When grandma decides it's time to 'clean up the neighborhood' and a good whupping isn't enough. Ok fido, get back into your cadge or you die. Eating WAY too much curds and whey. who sat down beside her and BLAM!BLAM!BLAM! Old Lady Muffet blew it away. They merged the "Pirates of the Caribbean" franchise with the "Critters" franchise & "Big Momma's House" franchise? I swear on all that is holy, Carl--this is the last time you get to pick on movie night. The "invader" looks like a cross between Davy Jones (Pirates) & the head Krite (Critters). The "Big Momma" reference should be obvious enough. FWIW, the first "Critters" is the only one of those movies I've actually seen. I remember the rest from trailers. I have no idea what that big thing is, but I think that greenish gray thing might be some sort of arachnid that's been eating atomic waste. I know what you mean (bamboozled). I saw this just a few minutes after John posted it. I had no frame of reference that was even remotely funny, even though I saw the Critters/Pirates thing in the "arachnoid" right off. Could have made a firearms safety crack, but they are beyond old. Let it rattle around in my head for a day & a big "whiff" fell out. I did read something recently--Obama has signed (or is about to sign) a UN treaty that has something to do with regulating firearms trade--& I think there was some talk of putting Iran in an administrative position over it. Need to research that one a bit (all but 1 of the few old pieces I have are imported mil/surp--could make feeding them an even bigger problem than it already is). "I am Mahmoud Ockhtohckhritirhead, & I am here for your sovereignty, infidel! Cover yourself or I keel you!" Why are most political jokes about the Right? Maher said the stuff that Democrats do isn't funny. He's right. Leftism is too frighteningly insane to be funny (& the closer one gets to hitting on the truth, the less funny it is). You had to have something in mind when you hatched this thing. It's an interesting illustration, but where would you go with it? 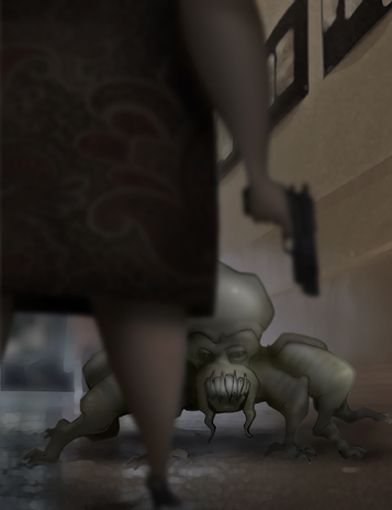 I was interested in showing a home invasion using an alien creature that hugged the ground, yet still had enough fierce quality to look particularly dangerous. I enjoyed showing the scene from a low-angle perspective and having the foreground filled up with this matronly, unconventional pistol-packing character. It has a movie-scene vibe that seems to ask for a Eastwood/Willis/Shwartzenegger cliche line that can be turned on its head. It's for the ambitious few. This one does not need any words. "Not on my watch, punk... or my carpet!" This page contains a single entry from the blog posted on July 12, 2012 12:07 AM. The previous post in this blog was Logo Illustration Idea. The next post in this blog is Automotive Report Cover Illustrtion for August.